What does an Asthma and Allergy Trigger Report Include and What makes for a Great Indoor Environmental Report (IEQ) or Indoor Air Quality (IAQ) Report? Click to see a IAQ Solutions Indoor Environmental Report Outline and see a what IAQ Solutions IEQ and IAQ Report Contains. Therefore, indoor allergens and irritants can play a significant role in triggering asthma attacks. It’s important to identify and recognize potential asthma triggers in the indoor environment and reduce your exposure to those triggers. Creating a healthier indoor home air environment is important for anyone, but especially for those affected by asthma. 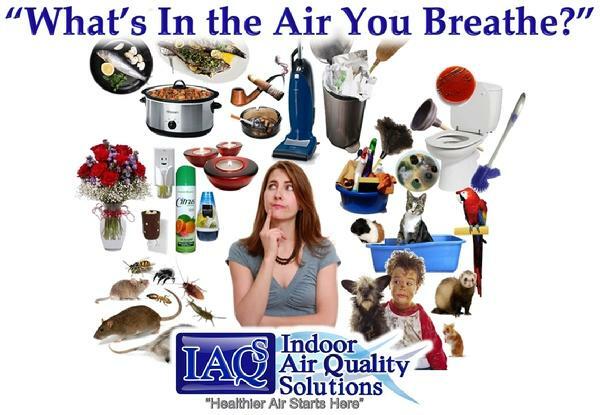 IAQ Solutions can help you with an indoor allergen and asthma trigger screening of your home. This investment will yield a wonderful dividend—fewer asthma flare-ups and, hopefully, a decreased need for asthma medications. Asthma is a serious, sometimes life-threatening respiratory disease that affects the quality of life for millions of Americans. Although there is no cure for asthma yet, asthma can be controlled through medical treatment and management of environmental triggers. US EPA. Six out of 10 people in the United States come in contact with cats or dogs. The total pet population is more than 100 million, or about four pets for every 10 people. People with dog allergies may be allergic to all dogs or to only some breeds. Cat allergies are about twice as common as dog allergies. The job of immune system cells is to find foreign substances such as viruses and bacteria and get rid of them. Normally, this response protects us from dangerous diseases. People with pet allergies have supersensitive immune systems that react to harmless proteins in the pet's dander (dead skin that is shed), saliva or urine. These proteins are called allergens. Dogs and cats secrete fluids and shed dander that contain the allergens. They collect on fur and other surfaces. The allergens will not lose their strength for a long time, sometimes for several months. They appear to be sticky and adhere to walls, clothing and other surfaces. Pet hair is not an allergen. It can collect dander, though. It also harbors other allergens like dust and pollen. Cat and dog allergens are everywhere. Pet dander is even in homes never occupied by these animals because it is carried on people's clothing. The allergens get in the air with petting, grooming or stirring the air where the allergens have settled. Once airborne, the particles can stay suspended in the air for long periods of time. If you have allergies or asthma, a tiny creature living in your home could be making big problems for you. Although you can't see them, if you have allergies or asthma you may be feeling their effects only too well. They are dust mites, and they live in many homes throughout the world. Dust mites may be the most common cause of year-round allergy and asthma. About 20 million Americans have dust mite allergy. Dust mites are well adapted to most areas of the world—they are found on every continent except Antarctica. It may not be possible to rid your home entirely of these creatures, but there are ways in which you can lessen your allergic reactions to them. Too small to be seen with the naked eye, a dust mite measures only about one-quarter to one-third of a millimeter. Under a microscope, they can be seen as whitish bugs. Having eight rather than six legs, mites are technically not insects but arthropods, like spiders. Mites are primitive creatures that have no developed respiratory system and no eyes. They spend their lives moving about, eating, reproducing and eliminating waste products. A mite's life cycle consists of several stages, from egg to adult. A female may lay as many as 100 eggs in her lifetime. Depending on the species, it takes anywhere from 2 to 5 weeks for an adult mite to develop from an egg. Adults may live for 2 to 4 months. Dust mites thrive in temperatures of 68 to 77 degrees Faranheight and relative humidity levels of 70 percent to 80 percent. There are at least 13 species of mites, all of which are well adapted to the environment inside your home. They feed chiefly on the tiny flakes of human skin that people normally shed each day. These flakes work their way deep into the inner layers of furniture, carpets, bedding and even stuffed toys. These are the places where mites thrive. An average adult person may shed up to 1.5 grams of skin in a day, this is enough to feed 1 million dust mites! When most people think of allergy "triggers," they often focus on plant pollens, dust, animals and stinging insects. In fact, cockroaches also can trigger allergies and asthma. Cockroach allergy was first reported in 1943, when skin rashes appeared immediately after the insects crawled over patients' skin. Skin tests first confirmed patients had cockroach allergy in 1959. In the 1970s, studies made it clear that patients with cockroach allergies develop acute asthma attacks. The attacks occur after inhaling cockroach allergens and last for hours. Asthma has steadily increased over the past 30 years. It is the most common chronic disease of childhood. Now we know that the frequent hospital admissions of inner-city children with asthma often is directly related to their contact with cockroach allergens—the substances that cause allergies. From 23 percent to 60 percent of urban residents with asthma are sensitive to the cockroach allergen. The increase in asthma is not fully understood. Experts think one reason for the increase among children is that they play indoors more than in past years and thus have increased contact with the allergen. This is especially true in the inner cities where they stay inside because of safety concerns. The job of immune system cells is to find foreign substances such as viruses and bacteria and get rid of them. Normally, this response protects us from dangerous diseases. People with allergies have supersensitive immune systems that react when they inhale, swallow or touch certain harmless substances such as pollen or cockroaches. These substances are the allergens. Cockroach allergen is believed to derive from feces, saliva and the bodies of these insects. Cockroaches live all over the world, from tropical areas to the coldest spots on earth. Studies show that 78 percent to 98 percent of urban homes have cockroaches. Each home has from 900 to 330,000 of the insects. Private homes also harbor them, especially if the homes are well insulated. When one roach is seen in the basement or kitchen, it is safe to assume that at least 800 roaches are hidden under the kitchen sink, in closets and the like. They are carried in with groceries, furniture and luggage used on trips. Once they are in the home, they are hard to get rid of. The amount of roach allergen in house dust or air can be measured. In dwellings where the amount is high, exposure is high and the rate of hospitalization for asthma goes up. Allergen particles are large and settle rapidly on surfaces. They become airborne when the air is stirred by people moving around or by children at play. Mold and mildew are fungi. They differ from plants or animals in how they reproduce and grow. The "seeds," called spores, are spread by the wind outdoors and by air indoors. Some spores are released in dry, windy weather. Others are released with the fog or dew when humidity is high. Inhaling the spores causes allergic reactions in some people. Allergic symptoms from fungus spores are most common from July to late summer. But with fungi growing in so many places, allergic reactions can occur year round. Although there are many types of molds, only a few dozen cause allergic reactions. Alternaria, Cladosporium (Hormodendrum), Aspergillus, Penicillium, Helmin thosporium, Epicoccum, Fusarium, Mucor, Rhizopus and Aureobasidium (Pullularia) are the major culprits. Some common spores can be identified when viewed under a microscope. Some form recognizable growth or colonies. Many molds grow on rotting logs and fallen leaves, in compost piles and on grasses and grains. Unlike pollens, molds do not die with the first killing frost. Most outdoor molds become dormant during the winter. In the spring they grow on plants killed by the cold. Indoors, fungi grow in damp areas, particularly in the bathroom, kitchen or basement. It is common for people to get mold allergy if they or other family members are allergic to substances such as pollen or animal dander. People may become allergic to only mold or fungi, or they may also have problems with dust mites, pollens and other spores. If you are allergic to only fungi, it is unlikely that you would be bothered by all fungi. The different types of fungi spores have only limited similarities. People in some occupations have more exposure to mold and are at greater risk of developing allergies. Farmers, dairymen, loggers, bakers, mill workers, carpenters, greenhouse employees, wine makers and furniture repairers are at increased risk. There is only weak evidence that allergic symptoms are caused by food fungi (e.g., mushrooms, dried fruit, foods containing yeast, vinegar or soy sauce). It is more likely that reactions to food fungi are caused by the food's direct effect on blood vessels. For example, histamine may be present because of the fermentation of red wines. Fungi on house plants can cause an allergic reaction, but this is only likely to happen if the soil is disturbed. Fungi can even grow in the human body. If not properly treated, intense inflammation can recur often. It can permanently damage airway walls. This is not common, though. The symptoms of mold allergy are very similar to the symptoms of other allergies, such as sneezing, itching, nasal discharge, congestion and dry, scaling skin. Some people with mold allergies may have allergy symptoms the entire summer because of outdoor molds or year-round if symptoms are due to indoor molds. Mold spores can deposit on the lining of the nose and cause hay fever symptoms. They also can reach the lungs, to cause asthma or another serious illness called allergic bronchopulmonary aspergillosis. Sometimes the reaction is immediate, and sometimes the reaction is delayed. Symptoms often worsen in a damp or moldy room such as a basement; this may suggest mold allergy. If you find that your asthma or your child's asthma gets worse when you use a certain product, consider trying different products. As pediatric asthma has increased over years, early diagnosis of pediatric asthma is important. Most of the time children breathe normally with asthma. Because children’s airways are narrower than adults triggers that cause only a slight response in an adult can be much more serious in children. In children, the symptoms can be severe and appear suddenly.Childhood Asthma is the most common chronic disease among children. Childhood Asthma is the number of children with asthma has risen about 75 percent since 1982. In 1996, 4.4 million children, or 6 percent of the U.S. population under 18 years of age, had asthma. Childhood Asthma is one of the highest-ranked causes of pediatric hospitalizations in the United States. Childhood Asthma is the leading cause of missed school days due to a chronic condition. Take Control of Your Indoor Environment Call IAQ Solutions Today to Schedule an Allergy and Asthma Screening of your home. When asthma symptoms appear and are diagnosed in adults older than 20, it is typically known as adult-onset asthma. About half of adults who have asthma also have allergies. At other times, adult-onset asthma may be the result of commonplace substances in work (called occupational asthma) or home environments, and the asthma symptoms come on suddenly. What is the difference between childhood asthma and adult-onset asthma? While they are in the minority, roughly 10% to 20% of adults with asthma developed their asthma as an adult. As this is less common, the diagnosis of adult-onset asthma can be more tricky to diagnose. Some adults will, instead, be given a diagnosis of chronic bronchitis. Adults tend to have lower lung capacity (the volume of air you are able to take in and forcibly exhale in one second) after middle age because of changes in muscles and stiffening of chest walls. This decreased capacity may cause doctors to miss the diagnosis of adult-onset asthma. Typically, adult-onset asthma patients are unlikely to "outgrow" their asthma and are somewhat more likely to require daily controller medications. A recent study showed that, in contrast to childhood asthma, only 5% of individuals with adult-onset asthma went into remission (when they no longer need treatment for their asthma). Women are more likely than men to develop asthma after the age of 20. This may be related to female hormones, as it has also been observed that many women with asthma will have more symptoms at the beginning of menstruation. Compared to the differences in causes and diagnosis of asthma in adults, asthma treatment for adult-onset asthma is very similar to treatment for individuals with childhood-onset asthma. How can you prevent asthma triggers at home? The most important thing you can do is to identify the asthma triggers in your home and then control those asthma triggers. The main asthma triggers that are in your home are dust mites, molds, pollens, pets, cockroaches, and household irritants. By identifying and eliminating asthma triggers in your home, you’re taking an important step toward managing your asthma. But avoiding asthma triggers is not always easy. If your child's airways are already inflamed, they will be more sensitive to these airborne allergens and irritants and will respond to smaller amounts of them. Since most asthma attacks in children are caused by an allergic reaction, there's a lot that parents can do to prevent or reduce asthma symptoms by limiting their child's exposure to allergens. Reduce Humidity. Air out damp, humid areas frequently. Run a dehumidifier (if necessary) to keep humidity bellow 50% rh. Clean Bathrooms often and keep them well ventilated. When bathrooms get damp from showers they can grow mold. Mold may be an asthma trigger for some people. Leaving a window open or running an exhaust fan when showering may reduce mold growth. Limit Dust Exposure. Babies and toddlers spend eight to ten hours a day in their rooms, so removing dust from their immediate area is a great place to start. Here's how to cut down on the dust in your child's room. Keep Your Home Smoke Free. Ask people to smoke outside. Do not use wood burning stoves or fireplaces. If you must, do not sit close to them. Buy Fragrance-Free Products. Items with strong scents such as perfumes and candles can irritate already sensitive airways. Ask family members to not wear strong fragrances. Rid Your Home Free of Bugs, especially cockroaches. No one likes these visitors but for people with asthma they can be a trigger. Use bait traps and always keep food in sealed containers and the kitchen area clean. Use a professional extermination service if a problem persists. Reduce or Eliminate the Pet Factor. Many kids are allergic to pet dander. It's best not to keep a pet at home if it triggers your child's reactions. If that's not possible, at least keep the cat or dog out of the baby's room. More than 50 million Americans suffer from allergies. Some sufferers experience short-term seasonal allergies, while a growing number experience chronic, year-round allergic reactions. Airborne allergens in the home air one of the most common causes for allergic reactions. Since many Americans spend up to 90% of their day in indoor environments it is essential to examine the air inside your home to identify what maybe causing chronic problems for you or your family. Are there Asthma Triggers In Your Home? Asthma makes breathing difficult for more than 22 million Americans.